In recent years, do-it-yourself (“DIY”) has gained popularity emerging in many fields including tax preparation and estate planning. While DIY for many fields may prove to be a good idea, what about DIY Estate Planning? With clear and reliable instruction, most people can create important estate planning documents on their own. 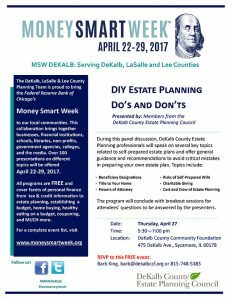 Join us on Thursday, April 27 as the DeKalb County Estate Planning Council presents DIY Estate Planning – Do’s and Don’ts, one of many programs offered during Money Smart Week. During this program, DeKalb County Estate Planning professionals will discuss several key topics related to self-prepared estate plans and offer general guidance and recommendations to avoid critical mistakes in preparing your own estate plan. The program will conclude with breakout sessions for attendees’ questions to be answered by the presenters. RSVP for this FREE program to Barb King, DeKalb County Community Foundation, barb@dekalbccf.org or 815-748-5383. The DeKalb County Estate Planning Council is a network of estate planning professionals serving DeKalb County. Established in 1981, the DeKalb County Estate Planning Council’s membership is comprised of attorneys, accountants, life insurance underwriters, trust officers, and others in the field of estate planning.